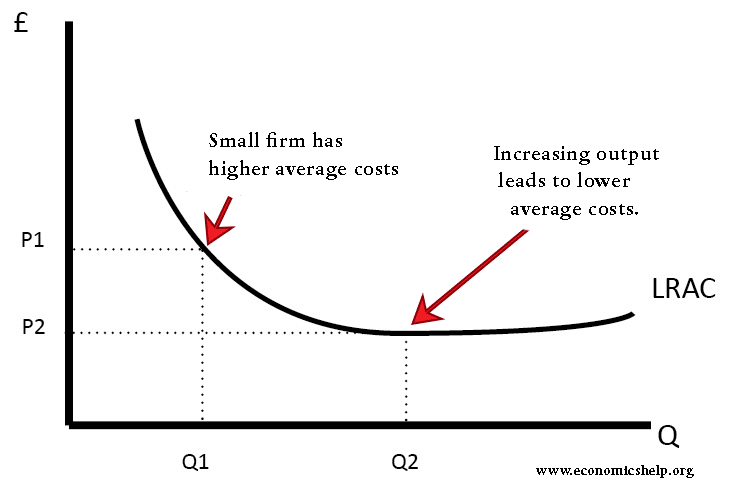 Economies of scale occurs when increased output leads to lower long run average costs. Basically as a firm expands it receives increasing returns to scale. To understand why economies of scale occur it is useful to think about large companies and how they benefit from their size. Fixed Costs is the key to understanding economies of scale. To build a modern car factory make require investment of £25 million. This is just for all the technology, machines and building. Therefore, if this car factory produced 1 car a year, its average fixed cost would be £25million. If 10,000 cars were built the average fixed cost would fall to £250 each. Clearly the more that you produce, the lower your average costs. This is why we don’t see many small car firms – they just wouldn’t be able to compete because they cannot share the economies of scale of bigger firms. Another common reason for economies of scale is buying in bulk. To give a very obvious example, if you buy a tin of baked beans the price may be 40p. If you buy a pack of 4 you will pay perhaps £1.20 (average price 30p) If you buy 24 from a wholesaler you may pay an average price of 20p. One reason for the cheaper price is that there are economies of scale in buying larger amounts. The transaction costs for buying 200 items is not much higher than buying 1 item. Basically, the more you buy the more efficient it is.